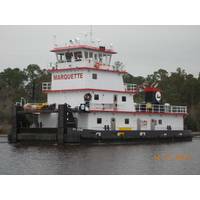 In December, Marquette Transportation Co. took delivery of a new 2,000-hp Z-drive towboat from Master Marine, Inc., Bayou La Batre, Ala. The 78'x 34’x11' St. John was designed by Entech & Associates, for Marquette’s Gulf-Inland division, based in Harahan, La. The steel-hulled St. John is powered by a pair of Thompson Power Systems Caterpillar C32 Tier 3 1,000-hp engines at 1,800 rpm connected to ZF Marine ZF AT 5111WM-FP Z-drives with 1,650 mm (65") 4-bladed propellers in nozzles. The package gives the boat a running speed of 10 knots with a loaded draft of 8’. The Z-drive revolution on the U.S. 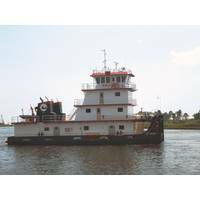 In August, Marquette Transportation Co. took delivery of a new 2,000-hp Z-drive towboat from Master Marine, Inc., Bayou La Batre, Alabama. The 78 x 34 x 11 ft. St. Peter was designed by Frank Basile of Entech & Associates, Houma, La., for Marquette’s Gulf-Inland division, based in Harahan, La. Master Marine is continuing to build Z-drive towboats, with more underway for Marquette, said the yard’s president Randy Orr. The company has continued to expand its workforce and production capabilities to handle the increasing demands of its customers.